Anyone looking for whitewater-rafting action will want to run the Kicking Horse River, which flows down the western slopes of the Canadian Rockies into British Columbia. Many operators provide transportation from Banff and Lake Louise (see Yoho National Park Whitewater Rafting) Rocky Mountain Raft Tours (403/762-3632) offers a one-hour (adult $45, child $20) float trip down the Bow River, beginning just below Bow Falls and ending along the golf course loop road. The three-hour Bow River Safari continues downriver to the park boundary (adult $85, child $40). No rapids are involved, so you’ll stay dry. 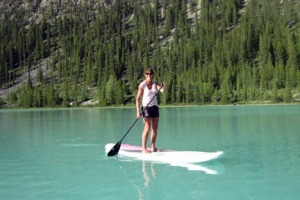 Stand-up paddleboarding, Lower Waterfowl Lake. On a quiet stretch of the Bow River, at the north end of Wolf Street, Banff Canoe Club (403/762-4554; 10 a.m. to 6 p.m. daily May to Sept.) rents canoes for use on the river, from where it’s an easy paddle upstream to the Vermilion Lakes and Forty Mile Creek; $36 one hour, $20 for each additional hour. 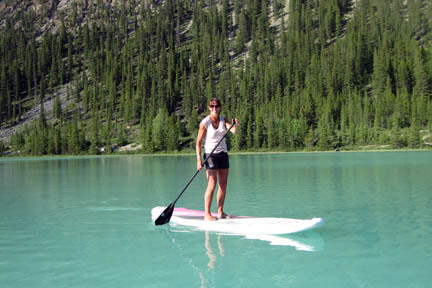 Banff Canoe Club is also the only place in Banff National Park with stand-up paddleboard (SUP) rentals. Cost is $25 per hour or $80 per day. You can launch directly in front of the dock and paddle up Forty Mile Creek to Vermilion Lake, or take the SUP out to Lake Minnewanka, Two Jack Lake, or Johnson Lake.